Two cars, with their enthusiastic passengers, set off from the Community Centre on a day when the weather forecast suggested we stay in and continue to eat our Christmas fare. But with the possibility of meeting others at our start point we put on a brave face and hoped that the forecast may be wrong. After meeting our fellow members we decided on a alternative route and headed off by car to Charlestown only to find that most of South -East Cornwall had the same idea as it was packed with watchers of the 11.00am swim. With the number of people around we became split into two groups; one who started the walk along the coast path and one I have heard decided to drink mulled wine and eat mince pies and walk from and back to the car park. 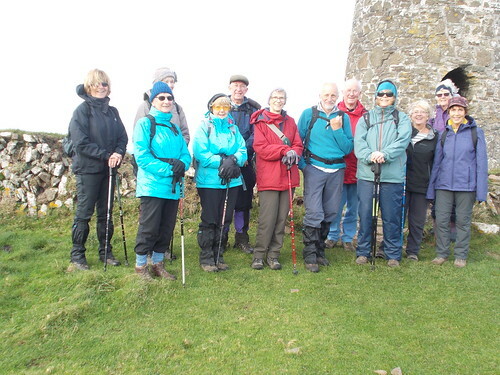 I can then only report of the activities of the walking group who appear in the photograph after our 2 mile walk before the rain eventually came at about 12.15pm. 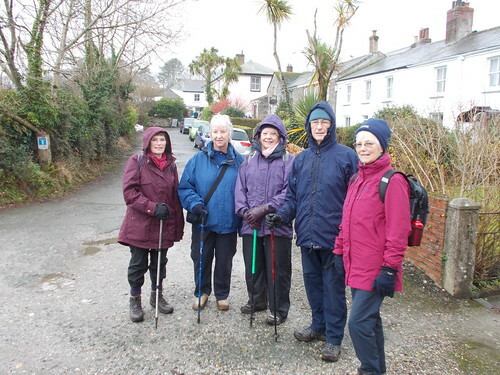 We went past the Porth Avallen Hotel and then onto the road back towards town and then over fields and through gardens back to Charlestown- abit muddy but we all made it safely and felt better for the fresh air. 2) FLATISH AND EASY TO GET SOME SEA AIR AND SEE THE SWIMMERS AT CHARLESTOWN USING COAST PATH, LANES AND MINOR ROADS. 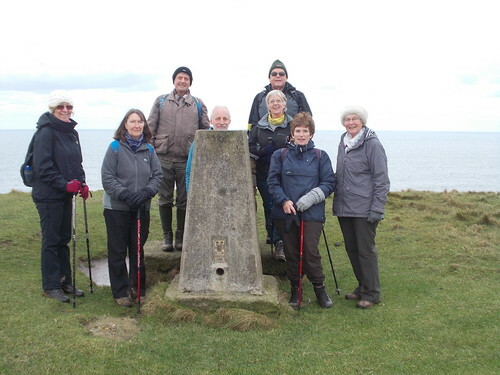 On a fine morning but with the forecast of rain due in mid afternoon nine walkers set off from the car park overlooking Widemouth Bay on a repeat walk we did in October 2015. Look back at the photographs taken then and see how much younger we look-must be all the exercise or those extra cakes. No need to spell out the route but we again headed for Elements Café/Bar after about 30 minutes walking and had an excellent drink and cake, inside this time, with great service from the friendly staff who welcomed us like regulars. Off again with our picture taken at Efford Beacon and towards Compass Point before heading inland to the sea lock and the canal. The coastal area at Bude has sand unusually rich in minerals and the poor agricultural land of the locality was found to benefit considerably from application of the sand. Several schemes were put forward for canals to bring sand to the countryside. One early scheme, conceived by Cornish engineer John Edyvean aimed at distributing Welsh coal from the port as far inland as Calstock on the River Tamar. It gained parliamentary approval for construction in 1774 but financial problems at the time frustrated the proposal-nothing changes in 2017!. More moderate proposals in 1819 resulted in the start of the construction phase which was completed in 1823 at a cost of £118,000. Back to the walk we decided to have lunch at The Olive Tree on the side of the canal sitting outside on the picnic benches-and very nice it was. With a breeze getting up and feeling a bit chilly we walked along the tow path to Helebridge and then across some muddy fields only to come to what was a ploughed potato field with no real path across that wasn't inches deep in mud and water. Finally reaching dry land by the roadside all looking as if we had just escaped from First World War trenches we regrouped to compare “muddiness” and who was in the running for the “Annie Muddy Legs Award” as the lady in question was not able to go on today's walk. Without wishing to sound like a racing commentator today we had two fallers and several near refusals with the underfoot conditions. Back to the cars with people sat in bin bags and on towels we found our way back home with rain starting as forecast as we passed through Camelford. 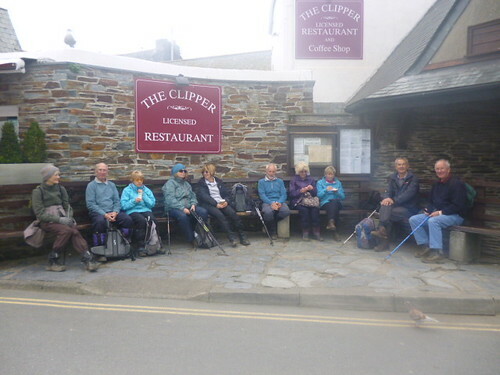 THIS IS A REPEAT OF A WALK WE DID ON 13TH OCTOBER 2015 WHEN 8 OF OUR PRESENT GROUP TOOK PART-WE HOPE THAT THOSE 8 WILL NOT MIND THE REPEAT AND CAN REMEMBER THE WAY! 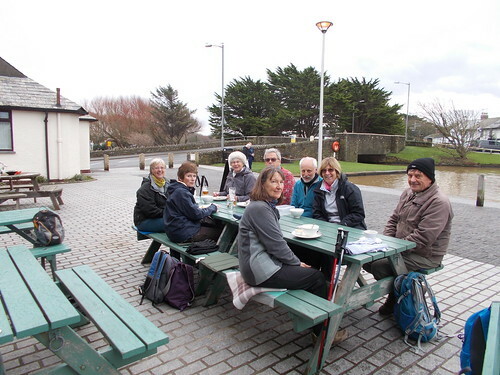 Seventeen walkers met in the community centre car park for this relatively easy 5 miles walk. 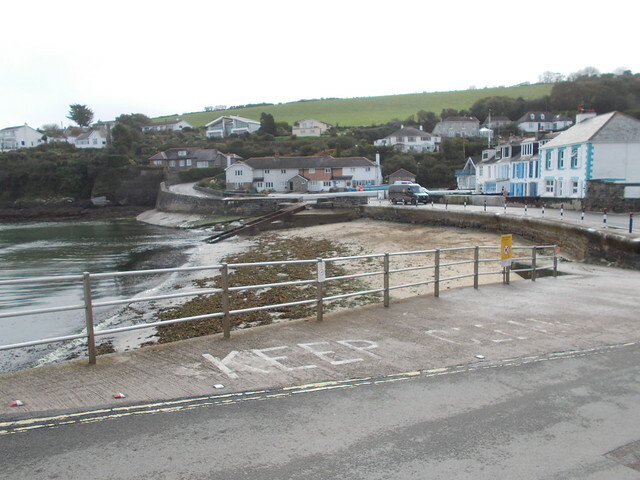 We made our way to the free public car park in Mylor Bridge. We crossed the road from the car park to Trevellan Road and walked along the quay and followed the sign for Restronguet Creek. After walking briefly between houses, the path emerges into a meadow which it crosses to reach the river again. We had great views of the creek and the houses on the other side. Those in Mylor Churchtown in particular are rather exclusive. We made our way to Greatwood Quay from which we had great views of Mylor Harbour and the Carrick Roads. From Greatwood Quay, we walked to the Pandora Inn and at Weir Point the path took us briefly onto a private beach from which we saw the first rainbow of the day. We were very lucky with the weather as, apart from a very short wintery shower lasting no more than a minute, we walked in glorious sunshine. Somebody else was getting the downpour! 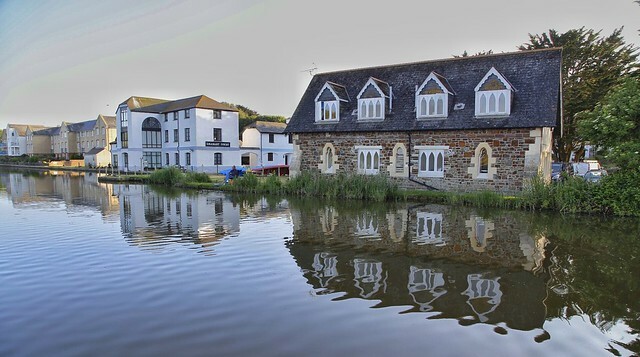 The Pandora Inn, which we reached 90 minutes into our walk, is one of the most picturesque waterside pubs in the West Country and the country. The building was originally a 13th century farmhouse. It then became an inn called the Passage House, since it was the base providing a short cut for road passengers between Falmouth and Truro. In 1791, the ferry sank and several lives were lost. Soon after, the inn changed its name to The Ship. It was bought by a retired sea captain, named Edwards, and renamed after the last ship under his command, HMS Pandora, which was sent to Tahiti to capture the seamen who mutinied against Captain Blight on the Bounty. To commemorate British and Irish gold medal winners at the 2012 Summer Olympics and 2012 Summer Paralympics, various post boxes in the home towns of the medal winners around the United Kingdom, plus one each on Sark and the Isle of Man, were repainted gold. It marked the first occasion in modern times that the colour of post boxes in the United Kingdom had been changed from their traditional red. Originally intended to be a temporary measure, due to the positive public response it was later decided the colour change would become a permanent tribute, with boxes additionally receiving their own special plaques. For sailor Ben Ainslie, the Royal Mail initially painted a box at the Pandora Inn in Restronguet Passage, Cornwall, the place he grew up and learned to sail. A member of the public then vandalised a box in Lymington High Street, Hampshire, on the basis that Ainslie was a longtime resident and considered a local "legend". After initially filing a complaint, the Royal Mail relented to a public campaign and decided to officially paint the Lymington box. Leaving the pub, we continued to follow the shore towards Hamlyn and from this section of the walk, we had great views towards the hamlet of Point on the other side of the estuary. We then followed a made up road which climbs away from the river. The track eventually emerges onto the country road above Mylor Bridge. We turned left and made our way back to Mylor Bridge. The second leg of the walk only took us about an hour. A relatively easy walk with no stiles and only one moderate hill towards the end of the walk. Plenty of mud though! We will leave the Lostwithiel Community Centre Car Park at 9.45am in order to start the walk at approximately 11.00am. On a pleasant although overcast day 13 walkers set off on our drive to our starting point just north of Crugmeer and towards two lay-byes which were close to the coast path. However with the many roads in Cornwall having pot holes it had been decided to mend this small dead end road on our walking day which meant a hasty turn around and careful parking on the side of the road in Crugmeer. Onto the coast path and following another walking group about 200yds ahead who we subsequently caught just as we entered Padstow. This group were the Black Sheep group from Tavistock who we had met on a previous walk at Cotehele in 2016. 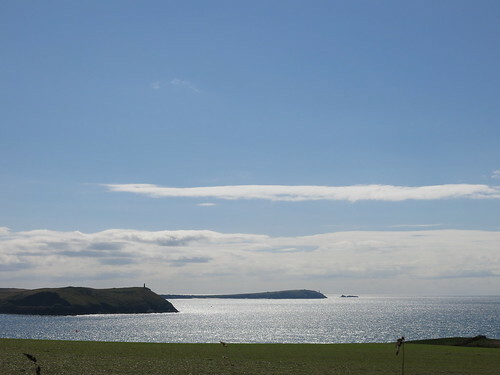 With the beacon on Stepper point clearly visible we were treated to views of this wonderful part of the coast with Trevose Head to our back and the dramatic Butter Hole in front with its multi coloured rocks and then to the collapsed sea cave of Pepper Hole and Gulland Rock off shore. At the beacon we had our customary photograph showing most in winter garb with hats and coats against the breeze. The lookout on Stepper Point is part of the National Coastwatch Institution a charity which helps to oversee the safety of persons and vessels along the UK coastline. The station proudly guards the entrance to the Camel estuary and the port of Padstow, with an excellent view over the notorious Doom Bar. 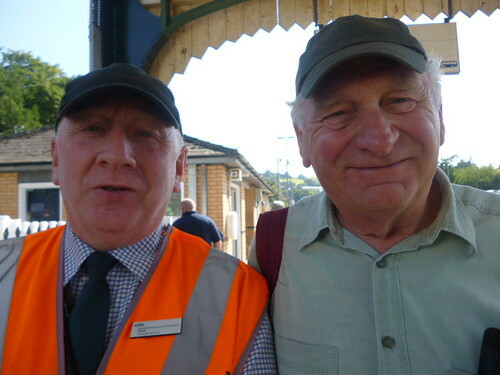 The station is manned from 0900 till 1500 through the winter periods and visitors are always made welcome. Passing the lookout we start to walk inland following the estuary and pass Hawkers Cove and the sand dunes at Harbour Cove. At Hawkers Cove we were not able to sample the excellent café located at one of the Coastguard houses as it closes at the end of October and does not open again until Easter. Walking parallel to the sand dunes we pass Gun Point and St Saviour's Point and the War Memorial before some decided to have their picnic lunch at this point on the many benches provided whereas other headed into Padstow for refreshments and all joined together for a photograph before we headed out of Padstow after we had caught up with two of our group who took leave of absence whilst other scoured the shops and cafés trying to find them. We passed Prideaux Place an Elizabethan Manor House which was built in 1592 and has been owned by the same family to this day. In the field opposite we saw about 50 deer and heard the booming sound of the stag as he eyed up his “lady friends”. Turning left and through about six fields containing brasicas we were soon back at our cars and the journey ck home. IF YOU COULD LET US KNOW BY SATURDAY 11TH NOVEMBER IF YOU WANT TO JOIN US FOR WALK AND IF YOU CAN OFFER TRANSPORT. 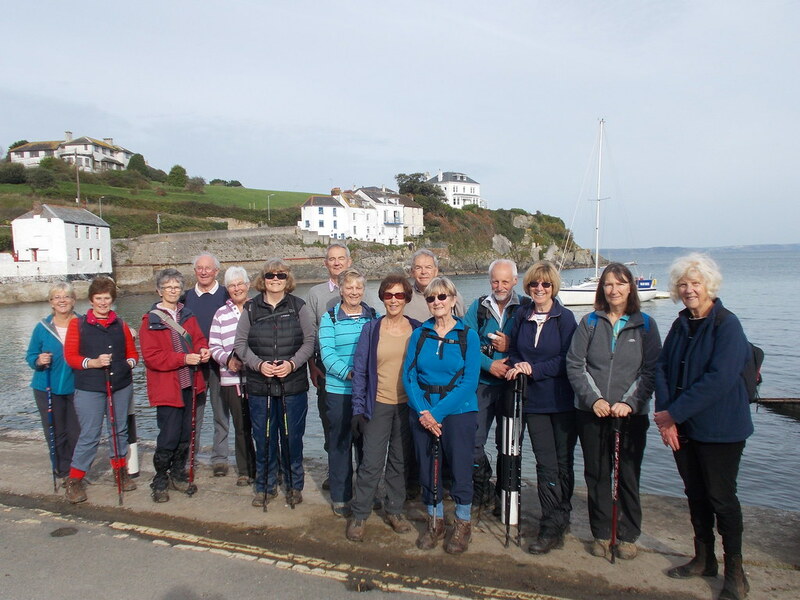 On a lovely October day with little wind and clear skies 15 of us set off on our 3.6 mile walk from the car park in Mevagissey to our first stopping point after about 10 minutes-yes you have guessed correctly a 11.00am tea/coffee shop with cake and toasted tea cakes and muffins all being eaten. The coffee was excellent and certainly one of the best I have tasted in the UK. 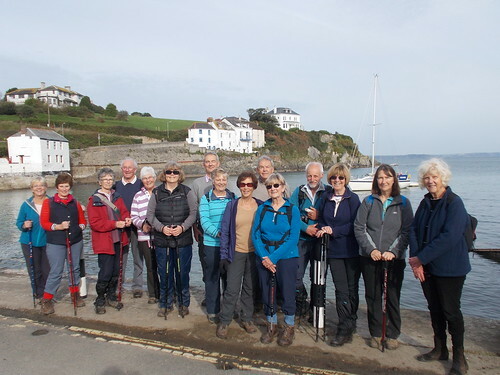 After about 40 minutes we headed out and up the hill with glorious views of the harbours with the tide in to turn sharply right-well 13 of us did but unfortunately 2 didn't and we didn't realised until one of the group got a phone call asking where we were! All together again with the two miscreants in the middle of the pack we proceeded up the field and followed the lane and footpath signs to Penwarne Manor. The manor house is privately owned and dates from 14th century with major restoration in 1640 and the five Grade 11 listed stone cottages are let as holiday accommodation converted from a 18th century barn. A look at the web site afterwards shows an immaculate interior and great reviews from previous occupants. 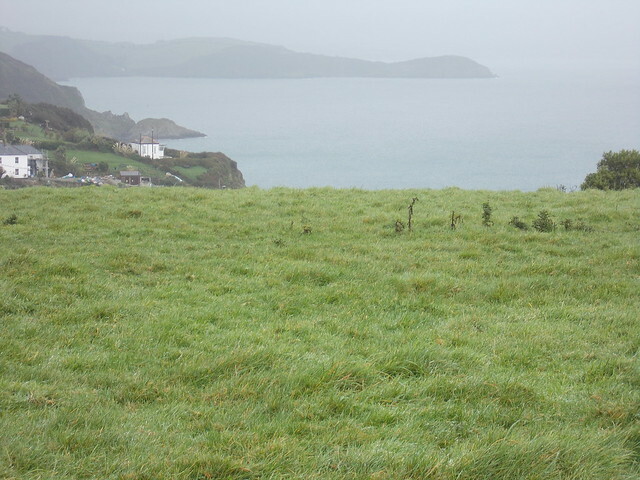 Our first photo is taken heading out into fields and up the valley from the sea with views of Portmellon to our left. We then dropped down to the valley floor and cross the stream at the bottom through a very muddy stile and bridge and turn again towards the sea and through West Bodrugan Wood Nature Reserve and over the steps to a meadow and gate and the boatyard and on the right a new construction of what looks like apartments. Time for another photograph, taken this time by a member of the public, so that we could all be visible and with the back drop of the harbour and a sailing boat. The first recorded settlement at Portmellon was the mill of Portmelyn which was still present on an 1888 map but by 1907 is had disappeared. The name is from the Cornish Porthmelyn meaning “mill cove” and even in the 1880's it was still known as Portmellin. Past the pub and up hill we walk towards the signs to Mevagissey and turn right to enable us to go down a zig-zag path towards the outer harbour. Some stopped for their picnic here and others walked down past the Aquarium and to the inner harbour seats and their picnic or purchases from local shops. We all gathered in good time and enjoyed the sights, the boats and a seal in the harbour, the ladies took the opportunity to look at the shops, some even bought something, and some had an ice cream with and without a flake before we wandered back to the cars and a timely exit. HILLS, STILES AND VERY MUDDY IN PLACES BUT SOME GREAT VIEWS. 2) FACILITIES IN MEVAGISSEY LIKE TEA/COFFEE STOP AND LUNCH IF YOU REQUIRE OR BRING A PICNIC AS IT WOULD BE NICE TO SIT FOR LUNCH. IF YOU COULD LET US KNOW BY SATURDAY 28TH IF YOU WANT TO JOIN US AND IF YOU CAN OFFER TRANSPORT. 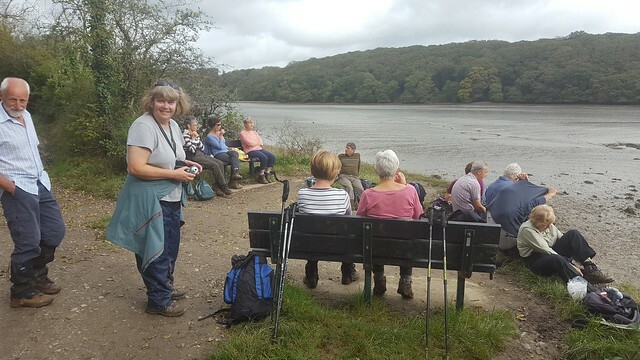 Fourteen walkers made to trip to Truro for this 7 mile walk. We parked in the free car park at Boscawen Park. We walked through “Sunny Corner”, a riverside area of Truro kept very tidy and pretty by a group of volunteers known as the Sunny Corner Conservation Group. The tide was still in at the beginning of the walk which made the estuary look very picturesque. Our first stop was in Malpas (Cornish: Moresk). It is here that the rivers Truro and Tresillian converge and the village is still a port with the navigable waterways to Falmouth and the sea. Malpas lies within the Cornwall Area of Outstanding Natural Beauty (AONB). Almost a third of Cornwall has AONB designation, with the same status and protection as a National Park. The Truro River from the city to the village form part of the Malpas Estuary SSSI (Site of Special Scientific Interest). It is an important habitat of tidal mudflats, which are feeding grounds for wildfowl and wading birds. By a very happy coincidence, on the second Tuesday of the month, teas, coffees AND cakes are served in the village hall. It was an offer to tempting to resist! Malpas Village Hall must be one of the halls with the best views. As we were enjoying our refreshments on the hall terrace, a double decker arrived carrying holidaymakers who were going to board the Enterprise boat for a river trip to Falmouth. Historically, the village is perhaps best known for its ferry service across the waterway to the Roseland and Tregothan estate. It is said that this is the crossing Iseult (from Authurian legend) made to King Mark's palace. Our second stop was in St Clement where the church is one of only three in the county with a lychgate. Lychgates consist of a roofed porch-like structure over a gate, often built of wood. They usually consist of four or six upright wooden posts in a rectangular shape. On top of this are a number of beams to hold a pitched roof covered in thatch or wooden or clay tiles. They can have decorative carvings and in later times were erected as memorials. In the Middle Ages, before mortuaries, and at a time when most people died at home, the dead were placed on a bier and taken to the lychgate where they remained, often attended against bodysnatchers, until the funeral service, which may have been a day or two later. The lychgate kept the rain off, and often had seats for the vigil watchers. Bodies at that time were buried in just shrouds rather than coffins. At the funeral, the priest conducted the first part of the service under the shelter of the lychgate. The churchyard contains an inscribed stone cross: the first word of the inscription is perhaps isnioc (later opinion believes ignioc). The inscription is Ignioc Vitali fili Torrici (i.e. Ignioc son of Vitalus son of Torricus) and the dating is 5th to 7th century. Another inscription is in Ogham, perhaps partly in Irish. The inscriptions are both older than the carving of the upper part into a cross. We then walked to Tresillian. 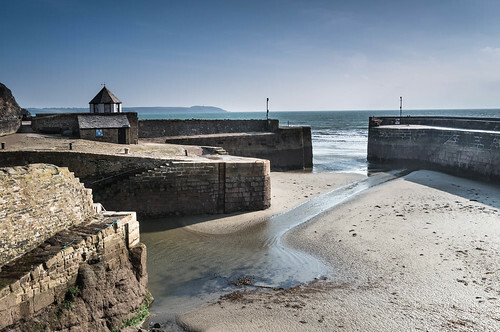 Tresillian (Cornish: Tresulyan) is located at the tidal head of the Tresillian River. 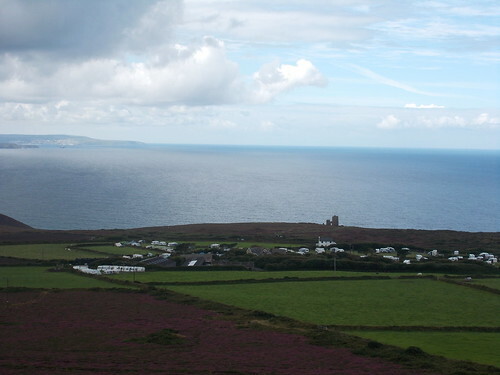 The name Tresillian is reputed to translate from the Cornish language as “a place of eels”, according to a 19th-century writer. However, modern toponymists generally agree that the name in fact, translates as “farm/settlement of a man called Sulyen” (a Celtic personal name from British: sulo-genos, “sun-born”). On the way back to St Clement, we stopped for lunch at a lovely stop with 2 benches by a small waterfall. Back in St Clement, we walked back a different way towards Malpas on a permissive path which took us through woods along the estuary. This meant that we were sheltered from the light drizzle which had started to fall. It did not last and the rest of the walk was dry (although not underfoot as we had to go through many muddy patches on this walk). Needless to say that once back in Boscawen Park, the group went to the café to enjoy a chat …and more refreshments. Fairly flat walk from Truro to Malpas where in the Village Hall on the second Tuesday of every month, they sell tea/coffee and cakes. What a lucky coincidence! 7. We will meet outside the community centre at 9.35 am for 9.45 am departure. 8. I would be grateful if you could let me know by Sunday 8th October if you would like to do this walk and if you are able to offer transport. On another fine day sixteen of us caught the 10.07 train to Redruth to explore the old Cornish town and its surrounding countryside and learn more about its relationship to Methodism. The name Redruth was gained from mineral mining as in medieval times the process of separating tin and copper from waste materials turned a local river blood-red with washed out iron oxide. The Cornish name for a nearby ford was Rhyd Druth the “red fort” and the village that grew around became Redruth. 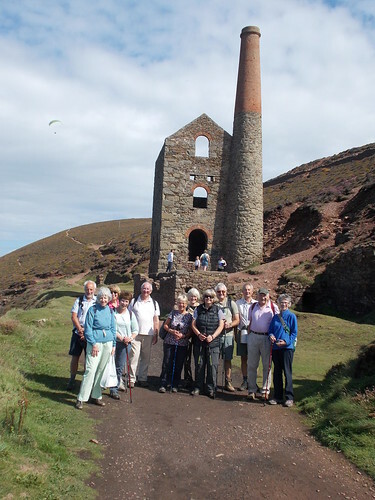 Walking from the station we pass the Wesley Centenary Memorial Building and up Sea View Terrace and with the chimney stack of Pednandrea Mine (it was once 8 storeys high but has now been reduced to 4) in view and up to Sandy Lane and the Public Bridleway to Grambler Farm. Here the paths are muddy after all the recent rain but we all managed to negotiate successfully without mishap to follow the next path to Gwennap Pit. We had given notice to the volunteers who run the Visitors Centre at the Pit that a group from Lostwithiel were to be expected but our expectations who surpassed as we had tables and chairs laid outside in the sun and excellent cakes and drinks made for us by two friendly staff who gave us valuable information about the Pit and the Busveal Chapel alongside. Our donations were thankfully received and a photograph duly taken for our records and theirs. 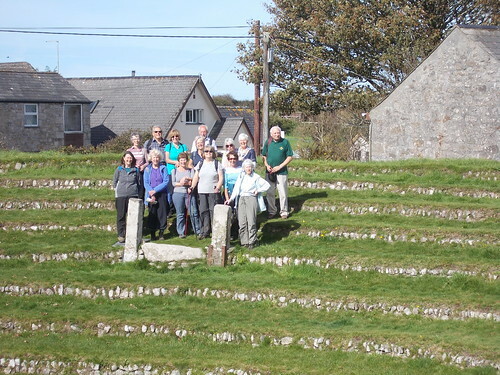 Gwennap Pit was possibly a hole created by mining activities which was first used for secular gatherings but soon became a sheltered venue for preaching and a favourite open air preaching venue for John Wesley who was taken to it in 1762. He preached at the pit on 18 occasions between 1762 and 1789. Now owned by the Methodist Church since 2001 it is used today for special services, musical events and weddings in conjunction with the small chapel built in 1836. 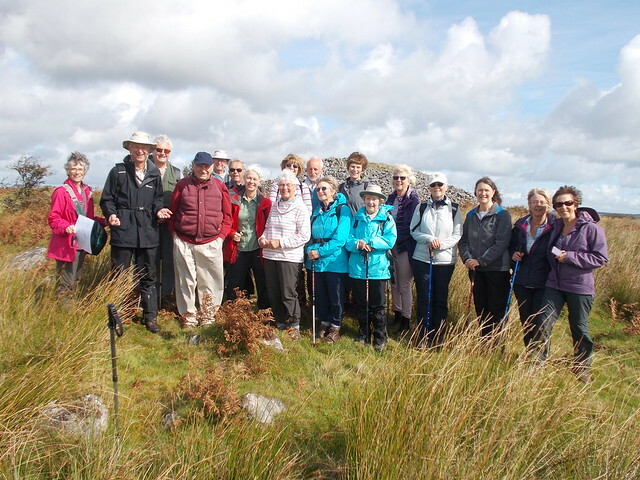 The group climbed into the pit to have an other group photograph along side the two granite posts which were the alter for the services taken by Wesley. Leaving the Pit we headed up gradually to the summit of Carn Marth and to one of the finest viewpoints in Cornwall and views over some of our recent walks at St Agnes Beacon, St Anthony Head, Dodman Point, Bodmin Moor and Falmouth Docks. An ideal lunch spot with the view and the flooded quarry and with the sun still shining and even more cake eaten to celebrate the imminent birthday of the writer. From here it is downhill along rough tracks and lanes to the heart of Redruth and decisions as to which train to catch and what else to do. Most went to look at the Tregellas Tapestries which show the story of Cornwall from prehistory to the modern day in 58 encapsulating tapestries. The work took three years to complete and has been on display since 2001. One of the Tapestries depicts Lostwithiel and Restormel Castle and are well worth seeing on a visit to Redruth with its interesting Town Trail. We all went to the local café, of which there is a good choice on the pedestrian main street, as one of our team had found out that the 15.17 train which most of us intended to catch had been cancelled so we had time before the 16.29. Another good walk to a destination that not many had been to before. 1) 4 MILE CIRCULAR WALK ON FIELD PATH, ROUGH TRACKS AND LANES. MUDDY IN PLACES WITH 6 STILES AND SOME MINOR HILLS. 2) WE WILL BE STOPPING FOR A PICNIC LUNCH; PLENTY OF PLACES TO GET TEA, COFFEE IN REDRUTH AT APPROPRIATE TIME. MEET AT STATION TO CATCH 10.07 FROM LOSTWITHIEL. IF YOU COULD LET US KNOW BY SATURDAY 23RD IF YOU WOULD LIKE TO COME. 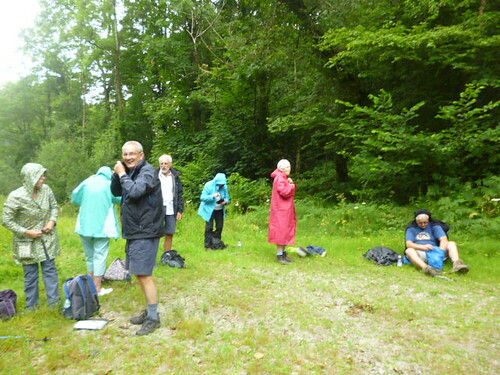 On a day forecast to be dry until about 5.00pm eighteen walkers were signed up for this walk of around 6 miles to be lead by John Keast, a resident of Warleggan all his life, who had volunteered to show us some of the history of the area but also to provide us with a cream tea at the end. It will be impossible for this report to cover everything that happened, all the information given and tales told and even the route taken so it will be very much a skeleton with all eighteen of us with our personal memories and facts remembered. Driving in convoy from Lostwithiel, although somebody did miss a turn, we headed through Mount to the well signed car park adjacent to the church to be met by our leader and after sorting ourselves out were soon heading north over Warleggan Down and towards Tor House, a house that had been in John's family for many years but that had been improved of late with an indoor water supply now installed. Passing through the gate and up towards Carburrow Tor and over rocks and through bracken we were shown remains of a Cornish Long House, a bronze aged round house and told of medieval round houses which we all would have missed as just rocks in the landscape. The first photograph in front of “another pile of stones” which are two mimics of Roughtor and Brown Willy many miles to the north but with very similar shapes. Passing over rough and wet terrain we headed for our picnic lunch beside a flooded disused pit and a “container” holiday home-just right for that quiet honeymoon away from everything! After lunch was very much about the mining industry where we learned about the tin mining with the associated arsenic production and the China Clay production at the former Glynn Valley Works crossing the infamous bridge twice. This bridge caused a dispute in the 1900's between the local councils of Warleggan and Cardinham. 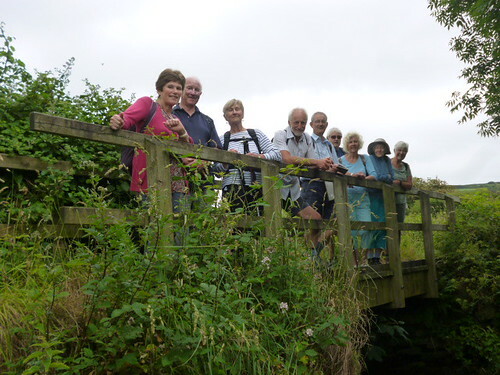 The photograph shows that the bridge is still standing and worth that £4 15shillings repair bill. At the China Clay works, the old manager's office now being occupied by marines, we saw the remains of the settling ponds, the dryers and the loading bays and further explanation from John A was very helpful. Back across the bridge and comfort break for some we decided to head back to Warleggan rather than the Treveddoe Mine to have that cream tea as clouds started to form. Before that we had a quick look around the outside of the church named after St. Bartholomew with is new roof and seeing the different quality of masonry on each side of the church indicating the differing ages of construction and then inside to see the refurbished organ. The vicar of the parish from 1931 until his death in 1953 was the Reverend F W Densham a gentleman who ended up preaching to no congregation except cardboard cut outs on the pews with names of past vicars written on them. It is well worth reading more of this strange story or listen to John when he gives his presentation at various societies in the area. Back then to an excellent cream tea supplied by Gill and John and to our cars after an excellent day out enjoyed by all and before rain came as predicted. faied they simply boycotted his services, and, each Sunday, he When this failed they simply boycotted his services, and, each Sunday, he would address a none existent congregation - resorting, it is said, to placing cardboard cut outs in the pews on which he wrote the names of past vicars. would address a none existent congregation - resorting, it is said, to placing cardboard cut outs in the pews on which he wrote the names of past vicars. 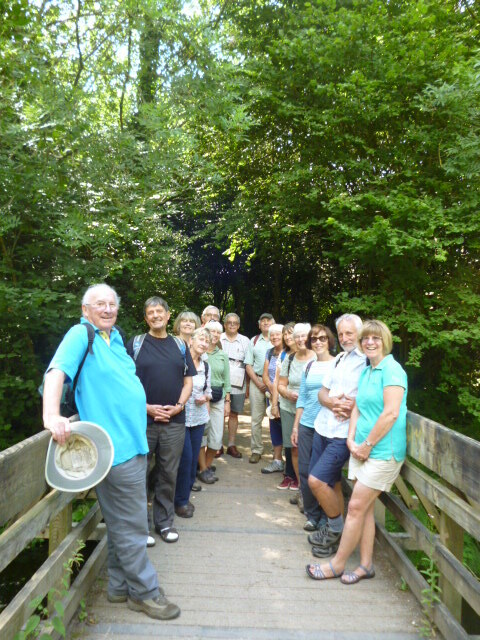 On one of the best days in August with bright blue skies and constant sunshine twelve lucky walkers enjoyed a typical Cornish walk with stunning coastal views and inland woods and fields. Although having to cope with a slight traffic hold up on the A30 we were soon nearing the village of St Agnes a prehistoric and modern centre for the mining of copper, tin and arsenic until the 1920's. Local industry has also included farming and fishing and more recently tourism. We parked on the cliffs at Carn Gowla near the National Coastwatch Institution Lookout. These 300ft cliffs run south from the headland of St Agnes Head. Walking along the South West Coast Path we pass the little promontory of Tubby's Head, once an Iron Age settlement fortified by an earth embankment across its neck. From here we passed through what once was an industrial landscape, where the ruins of mine buildings stand as dramatic memorials to Cornwall's great era of mining. One such building is the Towanroath engine house, the former pumping house for the Wheal Coates Mine, an ideal place for our first pictorial record. Descending into the popular Chapel Porth Beach with many people in the surf we stop at the seasonal café for some birthday cake to celebrate Sue's recent birthday-the cake very kindly made by Anne. the Beacon Country House Hotel towards the Beacon. 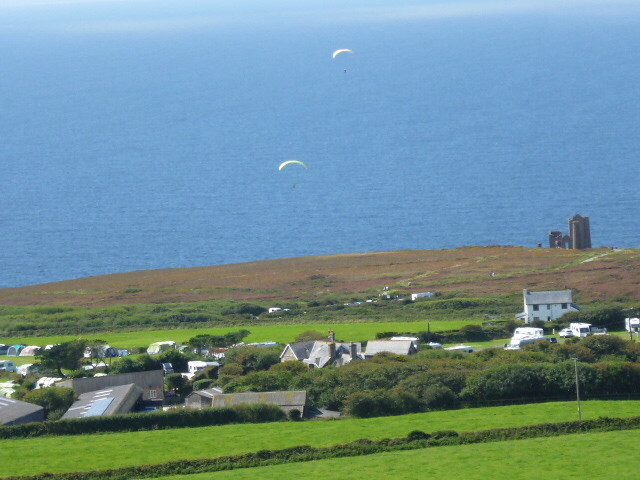 From its 630ft height we had great views around 360 degrees including St Ives along the coast. With such a view it was decided this was an ideal place for our lunch sheltered on the north side from the breeze . Walking down again towards coast we noticed the burnt marks of an earlier gorse and heather fire. A fire which affected 5 hectares, an area equivalent to eight football pitches. WE WILL MEET AT COMMUNITY CENTRE AT 9.45AM FOR 9.50AM DEPARTURE. IF YOU COULD LET US KNOW BY SUNDAY AUGUST 13TH IF YOU WANT TO GO AND IF YOU ARE ABLE TO OFFER TRANSPORT. 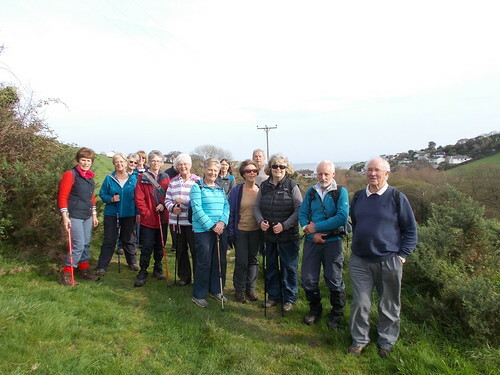 This walk, organised by our members Rob and Sue Wheeler and friends of Bradoc and St Winnow Church is a regular event and helps to raise money for both Bradoc and St Winnow Church Funds. We start at Bradoc Church at 12.00 noon for everyone to enjoy their own picnic with tea, coffee or a cold drink being provided. The walk starts at 1.00pm through the Boconnoc Estate and on to St Nectans Chapel where a splendid afternoon tea will be available to purchase-the funds going to the church funds. 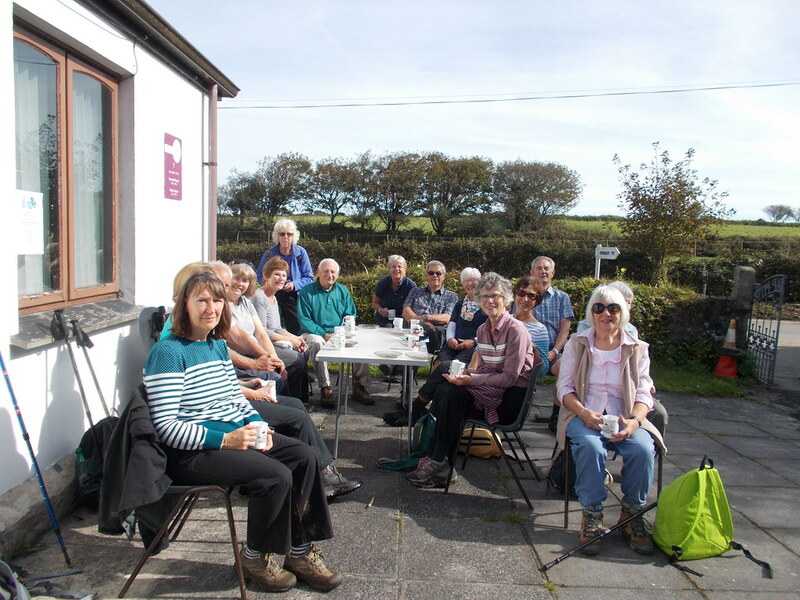 After time to enjoy the refreshments we will carry on to St Winnow where the famous Angies' tea room will be open and we will be able to rest and await the shuttle service of cars to take us back to Bradoc. 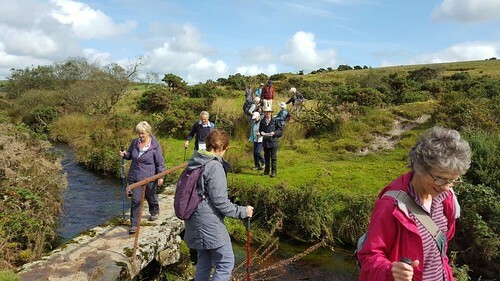 We hope that you can make it on this lovely walk with the additional benefit of the excellent refreshments, good company and the charitable cause. If there is sufficient interest I can organise transport from Lostwithiel. Please let me know by 23rd August if you would like to go on the walk and if you want to share transport. Boarding Cross Country Rail’s Manchester train from a sun-bathed Lostwithiel Station augured well for our first walk abroad that was to begin with a train journey through East Cornwall and into South Devon – a welcome reminder of the South West’s beautiful scenery, not often viewed from the tranquility of a modern train. Following a brief stop in Plymouth to load the restaurant car, the train arrived on schedule and our fifteen would–be walkers alighted and walked up the steep hill to the top of Totnes Fore Street, passing the castle on the way; one of the best preserved examples of a Norman Motte & Bailey Castle in England (The subject of a second trip, perhaps?). Agreeing to meet at the bottom of the Fore Street, the group dispersed to reconvene an hour later having fed and watered themselves and created the desire to return at a later date to view the many individual shops in more detail. The walk proper started from the lowest bridging point on the River Dart where the gravel path followed the river to arrive at a weir defining the highest navigable point, adjacent to a disused Dairy Crest Creamery; originally the site of one of Brunel’s pumping stations for the Atmospheric South Devon Railway built in 1857. A wooden footbridge crossing a drainage ditch over a leat, which once supplied water to power a number of waterside industries and at the same time drained the marshes, afforded our first photo opportunity. A short distance later we arrived at the gates of The Dartington Hall Estate, headquarters of the Dartington Hall Trust, a charity specializing in the arts, social justice and sustainability. Purchased in 1925 by Dorothy & Leonard Elmhirst they set about refurbishing and redeveloping the whole estate using Dorothy’s not inconsiderable inheritance and established a number of commercial enterprises to support it, many of which survive today. 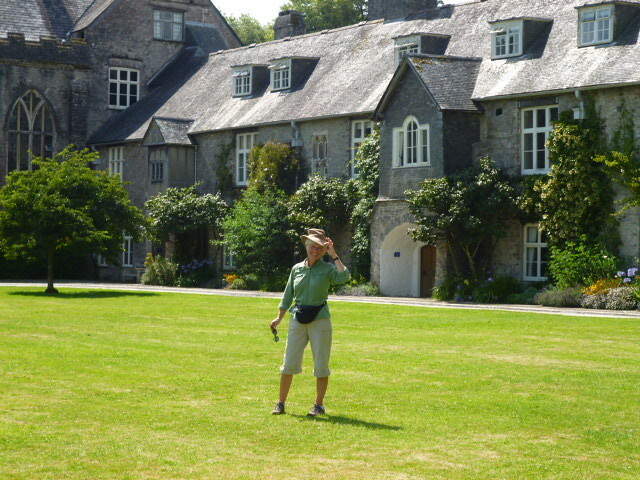 The trust runs 16 charitable programmes , including Schumacher College and The Dartington International Summer School, in addition to developing and promoting arts and educational programmes, acting as hosts to other groups and as a venue for retreats. The hall itself is a grade 1 listed building and the gardens a Grade II* listed in the National Register of Historic Parks & Gardens. At least one of our number could have made a home here! Our purpose, however, was to enjoy a walk round the estate and so, after a walk through the courtyard, a brief look in the main hall and a stroll through the formal gardens we left by a gate at the top, glimpsing the Tors of Dartmoor on the horizon, before descending the hill, passing the Dartington sports grounds on the way to arrive at the Cider Press Centre for a look at the shops and a cup of tea. Our route continued along a gravel path beside the river and on the fringe of rising woodland, passing the site of the original 1938 Tweed Mill with its working water wheel, to return to the lodge gate by which we entered the estate. Retracing our steps along the river bank took us to Totnes railway station and the IT training that ensued. As Lostwithiel station has neither a ticket office nor ticket machine and the morning train had apparently been ticket-collector-less we had been unable to obtain tickets on the outward journey. Honest citizens that we are, since Totnes ticket office was also closed, we set about obtaining 15 independently funded tickets from the single machine on Totnes platform. This took more than half an hour, the last of us obtaining a ticket just as our train pulled into the station! As this train was also ticket-collector-less apparently, we were left wondering whether honesty really was the best policy! On the whole a most enjoyable day out with excellent weather and a most interesting venue. The only thing missing? Chris, our regular leader who was unavoidably detained on the day, but is to be congratulated on his careful planning and detailed instructions! Our time on the platform at Totnes did permit one member of the group to explore any blood relationship that may have existed with his double. DUE TO BAD WEATHER FORECAST THE WALK SCHEDULED TO TAKE PLACE ON THE 11TH JULY WILL NOW TAKE PLACE ON THE 25TH JULY. DETAILS OF THE WALK WILL BE AS SHOWN PREVIOUSLY. FOR THOSE WHO WANT TO COME WE WILL SEE YOU AT LOSTWITHIEL STATION TO CATCH THE 10.45AM TRAIN TO TOTNES. IF YOU WANT TO JOIN US CAN YOU LET US KNOW BY SUNDAY 23RD JULY. THIS WILL BE THE ONLY FORMAL WALK IN JULY AND WE SHALL ALSO BE DOING ONE ON 15TH AUGUST AND THEN REVERTING TO 2 PER MONTH IN SEPTEMBER. 6) TIME TO BROWSE IN TOTNES AND PLENTY OF CAFES, EATING PLACES OR BRING YOUR OWN. 5) PLEASE NOTE THAT WE HAVE NOT DONE THIS WALK AND SO ROUTE MAY BE FLEXIBLE! WE WILL MEET ON UPLINE PLATFORM FOR 10.45AM TRAIN. IF YOU COULD LET ME KNOW BY SUNDAY 9TH IF YOU ARE COMING. St. Mawgan, an attractive village with an imposing 13th century church, a craft shop, a village store and tea room, a pretty school and The Falcon Inn all clustered together in the delightful wooded Vale of Mawgan. The village is today home to Newquay Airport the long runway being built for RAF St Mawgan. 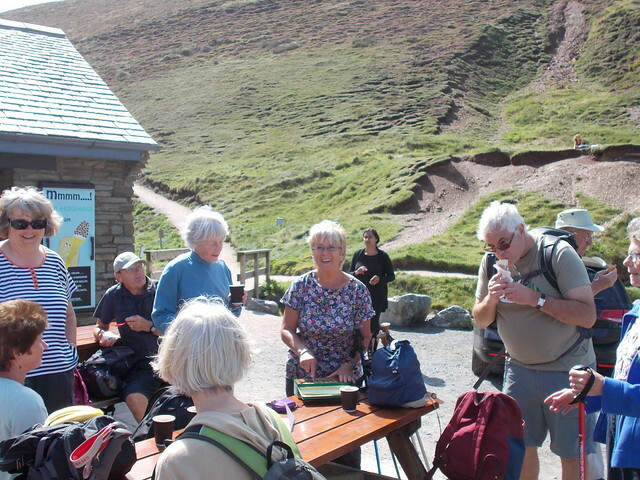 As expected we arrived at the tea room at 10.58 and with only 2 minutes to opening we all decided to have a drink or cake before starting our 4.5 mile circular walk. Passing the lych-gate of St Mawgan-in-Pydar church we start our walk. Set in the Vale of Lanherne( the alternative name for the valley) the church was endowed by the Arundells who lived there from 13th to 18th century. In 1794 the Arundells gave their Manor House, the imposing building behind the church, to the Camelite nuns to use as a convent. Today an enclosed community of Franciscan Sisters live there still guarding the relics of St Cuthbert. The route then takes us westerly along side the River Menalhyl, past a grand stone farm buildings and over the river, where we stopped for our posed photograph, and back on the northern side towards St Mawgan again and passed some imposing newer properties all with balconies looking over the valley. Stopping some people returning to the café or pub we then started on our second loop and climbed above the village looking for our turning right - at this point our two leaders where in some doubt that they were going the right way despite some frantic map reading - we did indeed find the turn towards Lawrey's Mill and past some refurbished old building towards the river again and to a patch of ground that we could all sit and have our packed lunch. The photograph taken during the meal shows that we had to put our rain coats on as we had the first real rain of the day. It didn't last long and we were soon on our way back to the car park and home before it did really rain. 5) WALK STARTS AT FREE CAR PARK BEHIND FALCON INN. IF YOU COULD PLEASE LET US KNOW BY FRIDAY 23RD JUNE IF YOU WISH TO COME ON WALK AND IF YOU CAN OFFER TRANSPORT.